IHSA Concrete Finisher Health & Safety Manual published! IHSA has published a new health and safety manual for Concrete Finishers.This manual covers all aspects of concrete floor health and safety. Please click HERE to download. Our national mandatory concrete standard CSA A23.1-2014 states that Cold Weather Concreting protection must be provided to ensure that the concrete materials do not fall below 10°C otherwise an abnormal set and problems can result (eg: delaminations). It is essential that the supporting granular base temperature is also at least 10°C to ensure that concrete materials are not reduced below this 10°C minimum temperature. Please note that recent testing has shown that concrete materials retain excess mix bleed water abnormally in cold temperatures. As such, it is critical that ambient and supporting temperatures are at least 10°C before placing concrete. Concrete mixes being supplied in air and granular base temperatures of less than 10°C will require a concrete mix review for cementitious material type (GU) and the use of non-chloride accelerators. Note that accelerators may change the colour of the concrete from that of conventional concrete (aesthetic concern). The CFCA is pleased to announce the publication of its 2014 Concrete Materials Laboratory Test Study on the plastic properties of concrete mixes at normal and cold temperatures. It has been found that sub-standard cold temperatures cause an abnormal retention of concrete mix water. Compliance with CSA A23.1 minimum temperatures and concrete mix requirements are essential to mitigate this concern. Please download and read the test report. 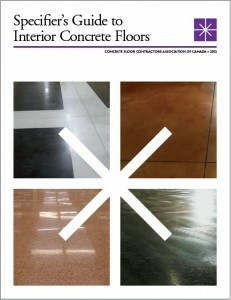 The CFCA is pleased to announce the publication of its NEW Specifier’s Guide to Interior Concrete Floors (including an 03 35 00 Concrete Floor specification section template). Carbon monoxide is the greatest continuing health hazard to the cement finishing industry. Please download and read the Work Safe Bulletin on Carbon Monoxide. Safety awareness, planning and incident avoidance are the first priorities in construction. All accidents can be prevented through proper planning, training, supervision, and care! We also have more information on cement finishing safety information. The CFCA is pleased to offer complimentary seminars to specifiers on the latest in concrete floor technology and finishes.